In previous posts on Ferneyhough’s music, I describe my approach to his complex rhythms. It is worth noting again that his music is not pulse based; rather, the measure is considered a “domain of a certain energy quotient”. In Cassandra’s Dream Song we are presented with freedom from measures, time signatures, or metronome markings. The Italian indications often refer to character more than actual speed: lento analitico, grazioso e rubato, molto rigoroso. So how fast do we play it? I can give no answers, but hopefully my ideas can give a clue as to what may work for you. Personally, I find this line is often performed too fast. I am guilty of this as well. Who doesn’t get excited by those closely-written, many-beamed tuplets at the end? But if you look carefully, I believe there is a compositional reason for those multi-beams. The beginning of the line has a sort of quarter-note feel to it. Under the first heavy arrow (indicating ritardando), the eigth-note becomes the rhythmical basis of movement (see, I try to avoid the word “pulse”, but maybe I am being too pedantic). By the A-natural things have slowed way down: lento molto con forza! (Composer’s exclamation point). That is one very long note, relatively speaking. By this time, like a compositional microscope, the rhythmical basis has magnified to the level of the 16th note. And then there is another ritardando! (The heavy arrow). It is as if we are being drawn even further through the lens of this microscope, experiencing progressively smaller units of the beat as time proceeds. Finally, we come down to the “atomic” level of the piece. It is an amazing ending. I did all this work not only to have a chance of playing the rhythms accurately, but as a crucial step in deciding: how fast? You have to find which notes are really the fastest (sometimes not the ones that look the fastest), and go from there. How fast you play will be an individual decision. I am not convinced there is a global metronome marking that works for the entire piece, but maybe someone else has another opinion. I do think the flow should be consistent within an individual line – with close attention if there are indications of change. In this entry, I present these sketches so that if you are interested in the piece, you can have a go at it yourself. The rest of the sketches are too large and lightly written to scan well. Please don’t ask me to scan or photograph the rest and post them (and not every line has been analyzed). However, I am happy to show them in person. This is a continuation of my previous post, where I use Taffanel/Gaubert’s Exercises Journaliers no. 1 to practice polyrhythms. Check that out before trying these! It will give you the correct placement in the measure for 4:3 and 4:5, which I have not notated here. 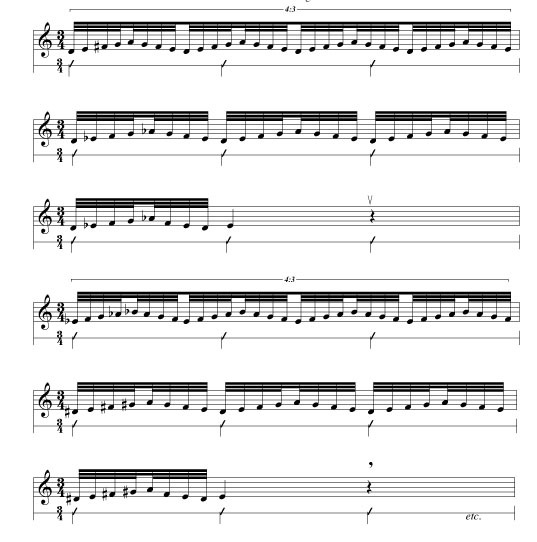 In these exercises, the metronome stays the same but the player has to change gears. I like to use this as an articulation exercise. You can shift from single tonguing to double tonguing as the tempo changes (but the metronome doesn’t). It keeps you on your toes. Set your metronome to a 3-beat pattern. The suggested tempo is a quarter note=45 but you can start slower if it helps. You’ll need to start on the third beat for this to come out right. I love the fact that this pattern gives you an added rest for breathing! 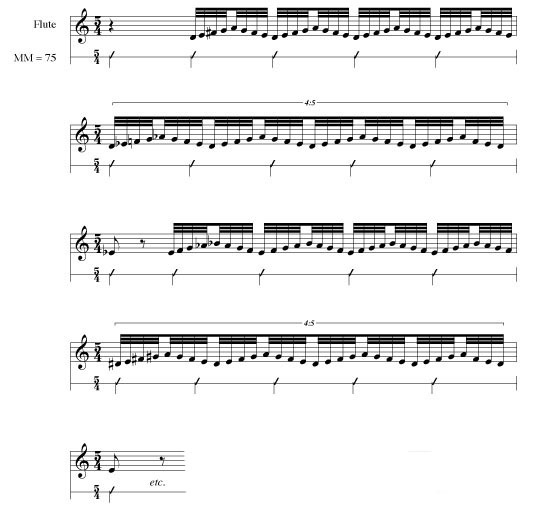 The following variation puts the polyrhythm first. If you are doing this as an articulation exercise, it is good to start with double tonguing and then go to single tonging. I find this shift to slower tonguing more challenging. 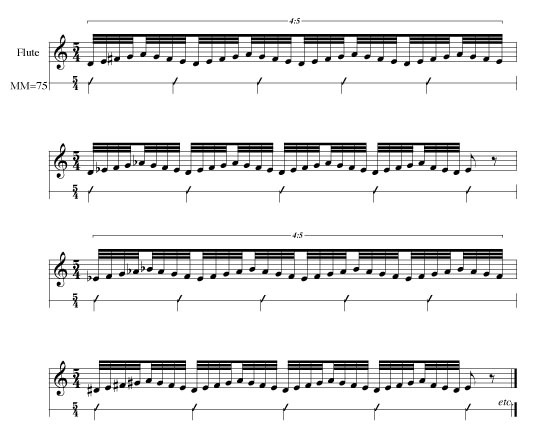 And here, a variation starting with the polyrhythm. I hope these exercises will be of some use. Please post a comment if you have questions. I have had various comments regarding the notation of these exercises. There are more detailed ways of notating them but I find the notation above gets the concept across. In the end, you don’t need the notes to perform the exercises. My goal in this was to use melodic material to develop a sense of rhythmic phrasing. Here is the third of my posts on rhythm. You can read the first post here and the second here. I wouldn’t proceed here unless you can perform the exercises of these previous posts. What I like about using Taffanel/Gaubert no. 1 from Exercices Journaliers is that it is a melodic study. In my first post, I emphasize the need for rhythmical phrasing, and the goal of playing rhythmically and not mechanically. One way of developing this, I think, is to develop your own strong, steady sense of pulse. This is something different from practicing with a metronome. If you test and develop your sense of pulse against the metronome’s ticking, it will grow stronger. You may have noticed that in both examples the 16ths are the same speed, only the metronome setting is different. 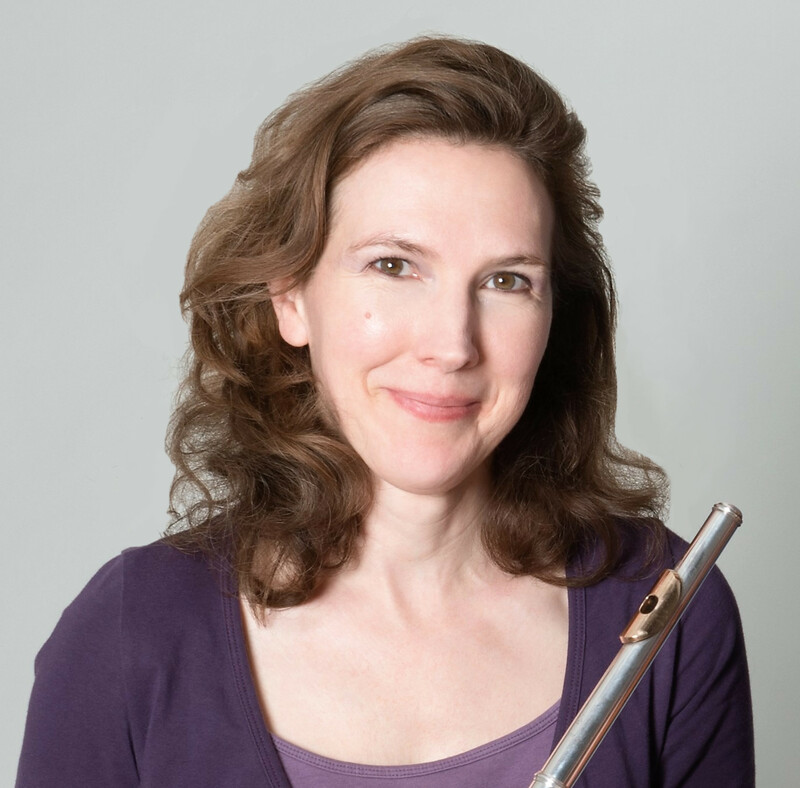 An interesting way to practice Taffanel Gaubert nos. 1 and 2 is to first play with the metronome at a quarter note = 120. Play a number of patterns until you feel comfortable with the speed, then continue but change the metronome to a quarter note = 45 and play the 4:3 pattern. When you feel comfortable with that, change the metronome to a quarter note = 75 and play the 4:5 pattern. This is a wonderful way of practicing groove! 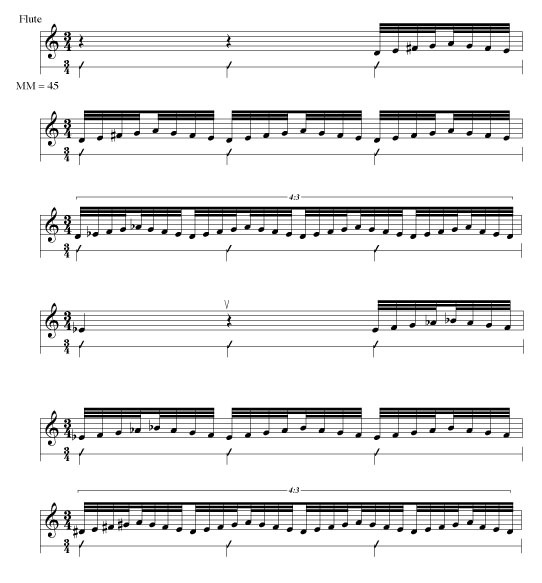 In my next post, I will use these same sort of exercises to practice tempo modulation.